* 22RWHP/16RWTQ with No Tuning! * 3/8" Thick flanges Innovative Bold Styling: Manufactured by American Racing Headers in 304 Stainless Steel, longtube systems are engineered for a great fit and outstanding performance. With 3/8" thick flanges, merge collectors with scavenger spikes, direct bolt-in X- pipe, other brands simply don't measure up. Systems are available in other primary sizes to accommodate normally aspirated or supercharged applications. 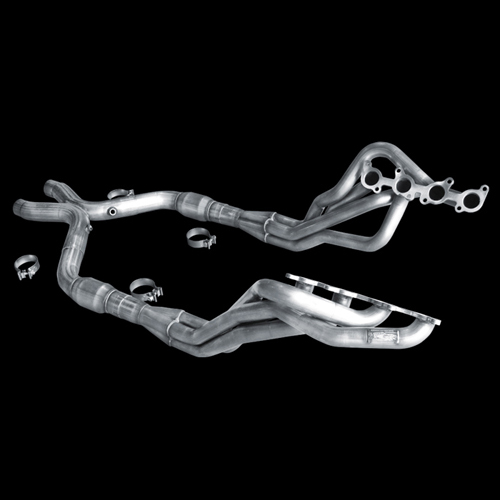 American Racing Headers are factory equipment on the 2010 Ford Mustang Cobra Jet. Our Quality & Finish will leave you with a grin from ear to ear as it is the Best looking unit available for your Ford Mustang or Cobra. Quality Construction: No one else can Stack up to the bold clean styling of our aftermarket Billet / Stainless Steel Dress Ups, Street / Strip / Racing Suspension and Performance Parts for your American Muscle Car like UPR Products! Fits these Vehicles: 2011 2012 2013 Ford Mustang GT 5.0L Coyote Boss 302 4V Roush & Saleen Vehicles.